Hay Hay! Tomorrow is Donna Day! It’s finally time for the next installment of Hay Hay It’s Donna Day! Started by the wonderful Barbara of Winos and Foodies, this has become my favorite online blog event. I have the honor of hosting this latest HHDD and I’m tickled pink. 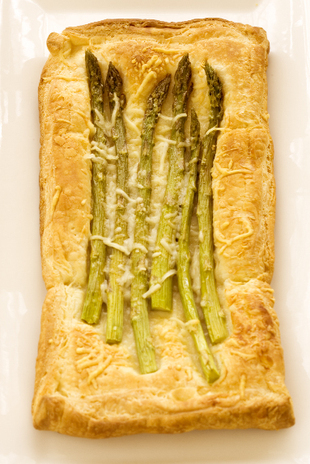 Given my love of Donna Hay and my well-recorded fascination with puff pastry, I chose this asparagus tart from Donna Hay’s Modern Classics Book #1. This recipe was easy and quite delicious. The original recipe will be at the end of this post. – The theme for HHDD #5 is savory tarts. This means no sweet stuff! Any variation on crust is fine. Use your creativity! – The roundup will be posted on September 22nd with voting to follow for a week afterwards. – Please post your entries and clearly mark them as a HHDD #5 post. After you post, please send an email to runningwithtweezers@gmail.com with the following information: your name, the name of your blog, your recipe’s name or title, your location, and the permalink to your HHDD post. – The most creative, original, and delicious looking tart will win a foodie-related prize from your truly and – more importantly – the honor of hosting the next Hay Hay It’s Donna Day! Roll out 375g (13 oz) of puff pastry on a lightly floured surface to 4 mm (1/4 in) thickness. Cut into four 7 cm (2 3/4 in) rectangles. Top with 5-6 trimmed pieces of asparagus spears and sprinkle with 1/2 cup parmesan cheese. Bake on a baking tray lined with non stick baking paper in a preheated 180C (350F) oven for 25 minutes or until puffed and golden. Pity I didn’t take some photos of the tart I made the other night, still never mind I’ll just have to make it again. Have you promoted the event on IMBB or the Food scool calendar, sticky date etc? That looks so very good. I love asparagus. yummy! great idea. I´m not much of a sweets baker, but savoury tarts are totally my thing. will definitely take part. Oh this looks great Tami. A quick question. Can I use a post I posted prior to Sep 8th? Would you believe me if I said I’d never heard of Donna Hay until a couple weeks ago when I was reading a forum at chocolate & zucchini about peoples favourite cookbooks? Soooo many people mentioned Donna Hay. To try to make up for my ignorance I will be producing a savoury tart sometime in the next week. i just attempted to make a tart for lunch and it was so disappointing I wont be able to enter it. Sam – mine was a bit of a disaster also – but I posted anyway. I am attempting tart no 2 now. just heating the oven. I have to take a course in English grammar soon, too. Thank you and I love it.